Mahindra will launch the XUV 500 on September 30th in New Delhi. A Mahindra spokesperson also told CarToq that the company will first unveil the vehicle on September 28th and 29th at the factory and in Pune respectively. There has been a lot of hype around the XUV 500 and a lot is being expected from it, being the first premium SUV from the company. Here’s what you can expect from the new SUV from Mahindra. Exteriors: The XUV 500 will certainly redefine its segment in terms of looks and comfort. 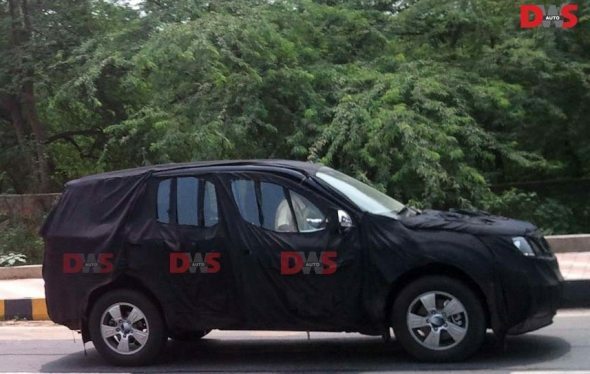 Based on the numerous spy shots of the upcoming SUV, we can safely assume that the XUV 500 will be the most ‘macho’ looking SUV from Mahindra. Read more about the XUV 500 here. The XUV 500 is likely to have a typical seven-slat Mahindra front grille (as seen on the Scorpio and Bolero) and day-time running LED lamps below the twin headlamps. The wide body of the XUV 500 coupled with its muscular wheel arches and big 16 inch wheels should lend it a sporty stance. The XUV 500 will be almost as long as the Tata Aria, but may not be as tall as the Scorpio. The XUV 500 should have ample road presence due to its proportions. Interiors: Again, going by spy pictures on the Internet, the interiors are likely to have leather wrapped four-spoke steering wheel with steering mounted controls. Expect adequate use of chrome on the instrument dials and inside door handles. The central console will likely have controls in a “water fall’ layout, and there will be useful storage bins inside the cabin. The fit and finish is expected to be top notch as the company aims to sell the XUV 500 to its export markets as well. Tata and Mahindra are foraying into premium SUVs and crossover segment for the first time. The Mahindra XUV 500 will target buyers of the Tata Aria on one hand and Skoda Yeti buyers on the other, given its expected price range. The XUV 500 will be a worthy competitor to the Tata Aria (Rs. 11.6 lakh – 15.8 lakh), Skoda Yeti (Rs. 15.3 lakh-16.7 lakh), Chevrolet Captiva (Rs. 17.9 – 19.7 lakh), and Ford Endeavour (Rs. 17 – 19.7 lakh). The base two-wheel drive variant of the XUV500 is expected to primarily be a comfortable people-mover with seating space for seven .Like the Aria it can provide car-like comfort but also has SUV-like looks, road presence and ground clearance. The top-end four-wheel drive variant is expected to have moderate off-roading ability and will come with an on-demand four-wheel drive system that is similar to the 4×4 Tata Aria (except that the XUV will drive the front-wheels when in 4×2 mode, while the Aria drives the rear-wheels). This degree of agility will also appeal to buyers of the Skoda Yeti, who want similar capabilities but a lot more space. There are expectations that the XUV 500 will have many features including automatic climate control, turn indicators on external mirrors, ABS, ESP, traction control and airbags. While the Airbags and ABS will likely be standard across all variants, the climate control and traction control will be available only in the top-end variant. Read more about upcoming cars from Mahindra here. Two-wheel drive variant: Mahindra will likely offer two 4×2 variants, with the base variant priced at about Rs. 12.5 lakh and the mid-variant to be priced at about Rs. 14 lakh. Four-wheel drive variant: The top-end 4×4 variant will likely be priced at Rs. 16.5 lakh. If the XUV 500 is priced above Rs. 17 lakh, it runs the risk of chasing buyers away to more established SUVs in the Indian market such as the Ford Endeavour and Toyota Fortuner. Mahindra is foraying into the premium SUV market with the XUV 500 and that too with a global product. Buyers in the premium SUV category look for snob value apart from features and looks. It will be a challenging task for Mahindra to position its XUV 500 as an attractive alternative compared to products sold by global brands like Toyota, Ford, Skoda and Chevrolet.